Mason Lowe, a professional bull rider died on Jan. 15, 2019, after he sustained injuries at the National Western Stock Show in Colorado. He was 25 years old. The event Lowe was scheduled to be competing at was the “PBR Chute Out.” This purpose of the event was to see how long a rider could stay on bucking and out-of-control bull. One witness, Gerardo Alvarez, told CBS4 that the bull threw Lowe. While on the ground, the bull stepped on his chest. Lowe got up, grabbed his chest, took a few steps and collapsed. The PBR president, Sean Gleason, released a statement on Twitter saying that they were sad to report Lowe died from injuries he obtained at an event in Denver. National Western Sports and PBR extends condolences to Lowe’s wife and family. KDVR divulged the bull rider was from Missouri and has been a professional for over seven years. Presently, he was ranked 18th in the world, earning almost $10,000 prior to his death. 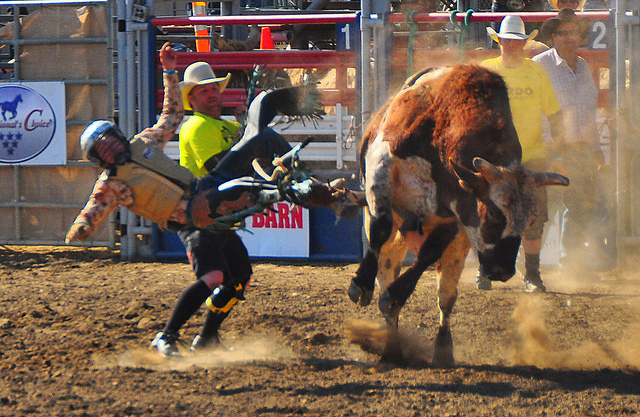 Lowe became a professional bull rider when he was 18 years old and ranked 14th at the height of his career. He said in a 2017 interview with PBR that he had loved riding since he was three years old. 2 Responses to "Bull Rider Mason Lowe Dies From Injuries Age 25"